School Assistants ( SA ) Secondary Grade Teachers ( SGT ) and LP other equivalent categories in Andhra Pradesh School Education Subordinate Service, herein after referred to as Teacher in these Rules.These rules shall come into force with immediate effect. The following categories of Headmaster Gr.II Gazetted / Teacher in the Government / ZPP /MPP shall be transferred. 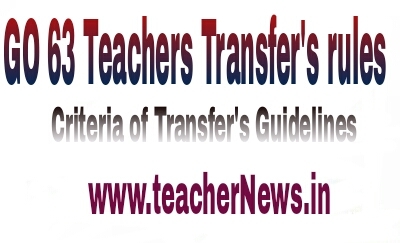 Those Teachers who have completed 8 years’ service in a particular school and the Headmasters Gr-II who have completed 5 years of in particular school as on 1st August (for the transfer year 2015-16 the cutoff date would be 1st August) shall be compulsorily transferred. Provided those who are going to retire within two (2) years from 1st August of the year shall not be shifted until and unless the incumbent requests for such transfer. The male Headmaster Grade-II/Teacher aged below 50 years as on 1st August of the year and working in Girls High School. If no women HMs / Teachers are available to work in Girls High Schools, then male HMs / Teachers who are over and above 50 years of age may be considered for posting to such schools. 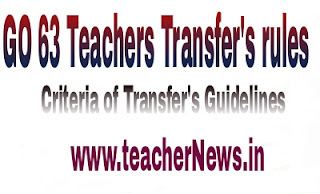 Headmaster Gr.II Gazetted/Teacher who has completed a minimum period of two years-service in a School as on 1st August 2015 of the year shall be eligible to apply for transfer. The teachers shifted under Rationalization i.e. Primary Schools and Upper Primary Schools and SGTs in High Schools (provided if required number of teacher posts are sanctioned in High Schools) shall participate in the Transfers Counseling regardless of years of service in the station. The Headmasters Gr.II Gazetted/Teacher who have completed 8 years’ service as NCC officer should be posted in a vacancy in a school where there is NCC unit. If there is no vacancy, they may be posted in a school where there is no NCC Unit, so that the NCC teacher may open a new NCC unit in the school. All transfers shall be effected from within the Present Management, Agency Area to Agency Area, Plain Area to Plain Area. Preference shall be given to HM Gr II, who have studied Urdu Language as 1st Language/Urdu as main subject to Urdu Medium Schools.